Coconut Magic Bars Recipe - AMAZING Magic Cookie Bars! 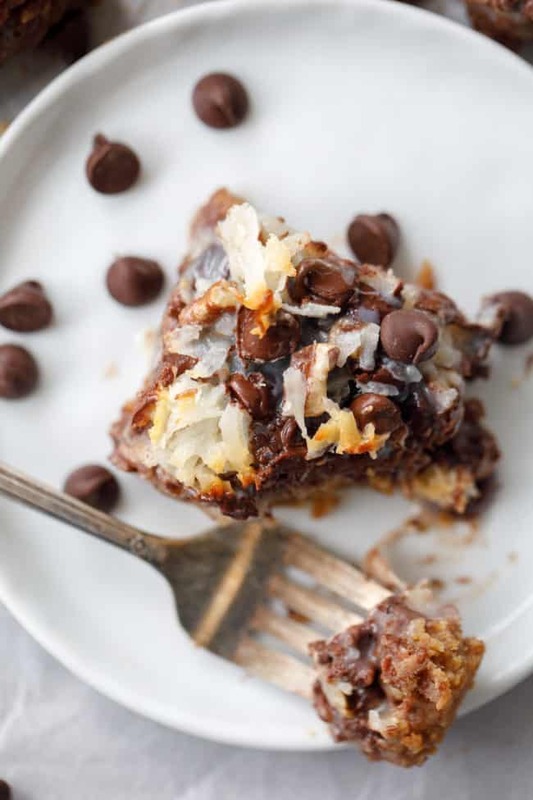 My birthday is coming up on December 13th (we won’t discuss my age…) and all I want are these absolutely incredible coconut magic bars. My mom has agreed to make them for me and I am so excited. This is my all-time favorite dessert recipe. No, seriously! 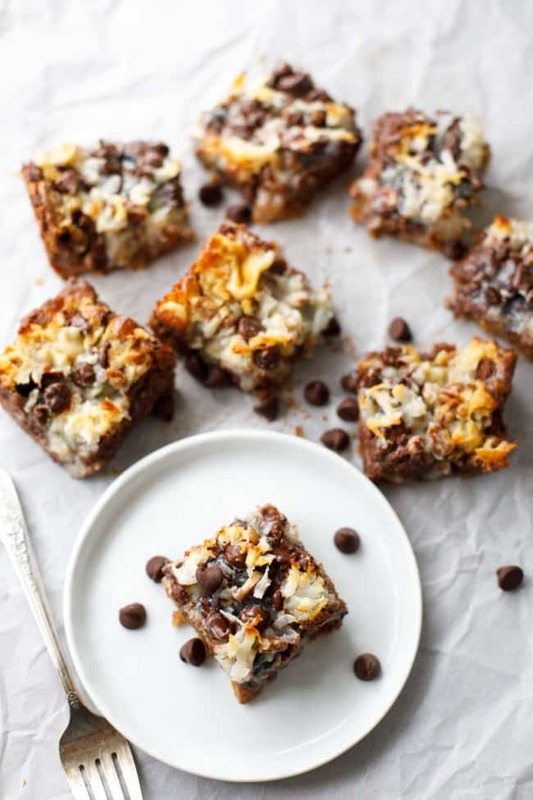 These coconut magic bars (sometimes called magic cookie bars or even just magic bars) are so easy to make that it’s almost funny. 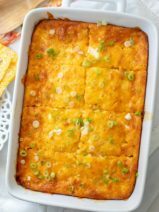 It doesn’t seem like something so TASTY could result from layering a few ingredients in a baking dish. Y’all, these coconut magic bars are like HEAVEN. For a different twist, try these decadent mint chocolate magic bars. I don’t typically go for dessert recipes that are quite this decadent, but I am just such a huge fan of the flavor combination. I am in love with coconut, chocolate, and pecans. I could literally eat a whole pan of these bars! Even though these aren’t exactly a festive holiday dessert, I also love making them for our Christmas celebrations. My whole family looks forward to these scrumptious coconut magic cookie bars. If you’re looking for more easy desserts, don’t miss my yummy and simple cherry dump cake recipe. 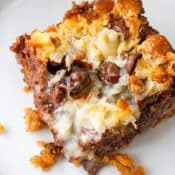 So, quite a few of you have left comments on Facebook telling me that you are familiar with this recipe, but you call them seven layer bars. Leave me a comment below and tell me what your family calls this tasty treat! Do you have a favorite dessert that you love having on your birthday? These coconut magic bars are out of this world and they may just become your new favorite dessert! :) Check out our fun tutorial video below to see just how easy these chewy bars are to make! 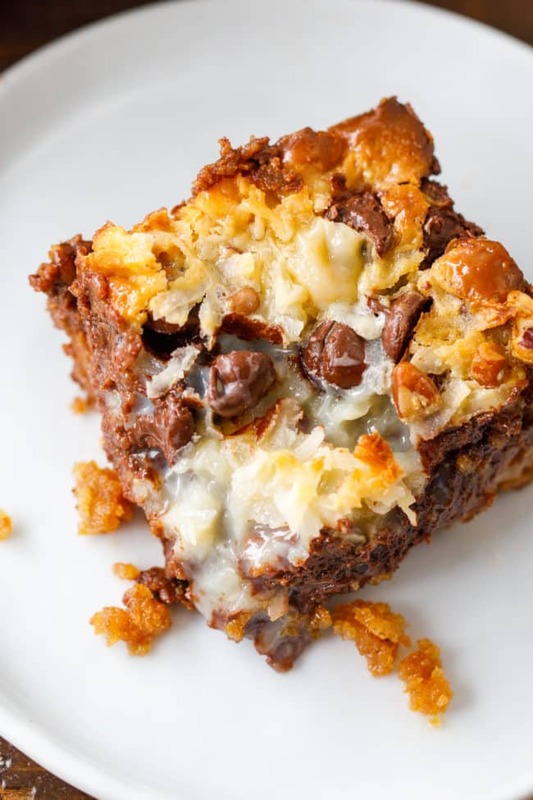 These ooey-gooey coconut magic cookie bars are my favorite dessert EVER! Crush graham the crackers. Stir the brown sugar into the graham crackers; set aside. Put the ½ cup butter into an 8 x 8 baking pan; heat in the oven until butter is completely melted. Remove from the oven and evenly spread the graham cracker and brown sugar mixture over the melted butter. In layers, alternate the chocolate chips, coconut, and the pecans. Evenly pour the sweetened condensed milk over the top. Bake for 30 minutes or until the coconut is lightly browned. Cool completely before cutting. I just made this sinfully delicious dessert and my husband is hooked. 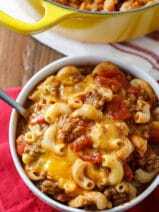 Thank you for sharing your delicious and simple recipe. seriously brilliant and so easy to make. My husband who does not do desserts, loved this and wanted me to make it every week! My mom called them Hello Dolly Bars. I loved them as a kid and still do!! Made them and they were seriously gorgeous.I used crushed up ginger nut biscuits as we don’t have Graham crackers here.It worked very well. Will certainly make them again. Thanks. If I remember correctly, my Mom called these Congo Bars and I LOVED them. So glad to find this recipe. I must try them soon. We do something similar, but we add a layer of butterscotch morsels. We also called them magic bars. A family favorite for sure. What would be the equivalent of the Graham crackers? I am longing to try this recipe. I cheated & used the already crushed graham crackers. I used the mini chocolate chips because that’s what I had in the pantry. I think it’s just as good. Easy recipe, very few dirty dishes to clean & I will make definitely manjeri this again. Next time I want to double the recipe so there’s more to share! Thanks so much for sharing your recipe! Just made this recipe! It’s baking as we speak. I can’t eat nuts, so I didn’t use the pecans. Since that didn’t add bulk to the overall recipe, I only used a cup of the sweetened condensed milk. I hope that works. I’ll let you know! My family has always called them 7 layer cookies. A few suggestions, if you mix the butter into the crackers and gently pat them down into the pan and then pour half of the can of condensed milk then layer the rest of the ingredients and pour the rest of the condensed milk on top they will cut beautifully, even the first square! I first tasted these over 10 years ago with butterscotch chips. Been meaning to make it since but never did. Brought them to a Christmas party last night and it was a hit with everyone. I used a 9 x 13 glass pan and added one-half of the original recipe (doubling it would have been too much but i can see it being doable. Bake longer accordingly). It was perfect. I want to add Carmel squares. Do you think it would affect it much? ******Question: ******Should the leftovers be refrigerated or is it not necessary? I made these tonight and we loved them but they were too sweet for us. Sending the rest to work with my husband in the morning. Not sure if they will keep on the counter or not???? 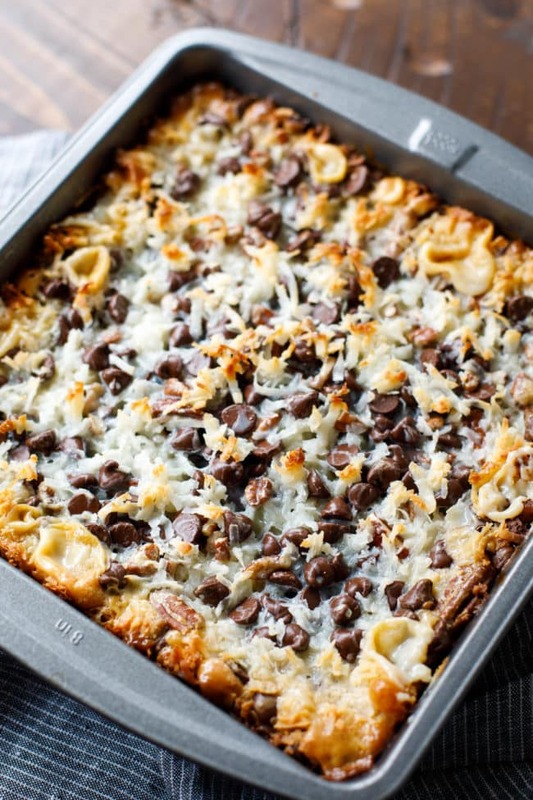 My mother made them years ago and called them Hello Dollies but since then I have seen them called Magic Cookie Bars. Whatever you call them, they’re delicious and always a favorite of mine! My grandma made these every Christmas! We call them Hello Dollies. My brother just asked me to make him some for Christmas. Hello Dolly’s! But mine has butterscotch chips also. 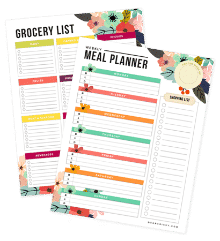 They are a favorite here too! I made these for my birthday coming up on the 15th. These are the best magic coconut bars ever! 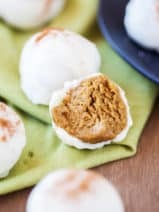 Super simple and easy to make, and taste delicious!! They look and sound they would be very good! 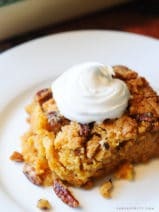 I’ve made these many, many times (my recipe uses butterscotch chips and makes a 9 x 13 pan) and yes they freeze very well. Just wondering what the recipe would be in grams? Would really like to make them! We call them Magic Bars and use a mix of semi sweet chips and butterscotch chips. 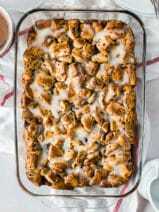 I looked all over for my recipe yesterday to take to our Thanksgivving meal. Today looking for something completely different (quit ideas) I stumble on it. Guess I’ll be taking it to our Christmas meal! Thanks so much! Could I make these tonight and leave them covered on my counter until tomorrow? Yes! I did. Then brought them to a party the following evening. My daughter and I have been making cookie baskets for 36 years. We call these yummy ones, Junk Bars, because we use up all the leftover coconut, chocolate, butterscotch, white chips and of course nuts!!! Not a comment. A question. If I double this could I do this in a 9 by 13 pan. I don’t double them and I make them in a 13×9. The bar is definitely thinner but my family likes them better this way! The toughest part of this recipe is waiting 30 minutes after taking them out of the oven to cut them and have the first one! Absolutely delicious! Girl, I know! This is my all time favorite dessert! These look amazing!! I love coconut and these look so decadent. We will definitely be making these soon. Thanks for sharing your delicious recipe with us at Merry Monday this week! These look irresistibly good! Thanks for sharing! We share a birthday!!! I love these bar!! These look incredible! What great treats! These are delicious! Currently making my second batch in as many weeks. Thanks for sharing! Going to give these a try! I have made these for years, 30+, but never put brown sugar in crust. They are so seeet without. As a small history lesson, my Mother made them too but they called them “Hello Dolly’s”. Looks very good. Would try it out this month.